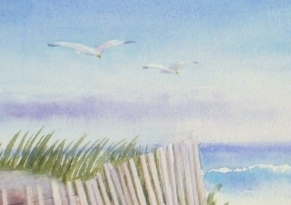 East Beach is a favorite Rhode Island beach for nature lovers. It's definitely my favorite. This barrier beach runs in a strip for 2 undeveloped miles along the coast, perfect for a long walk at water's edge. Portions of it are designated for wildlife since seabirds nest along its length. On the grassy dunes wild beach roses bloom in summer. First, as always, I begin with the sky. I wet the sky, then wash in a bit deeper blue at the top adding more water going down the paper until the sky is a very pale blue near the horizon. I have left some light areas for clouds. 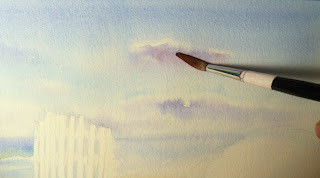 While the paper is still wet, I add cloud shadows in a lavender color. 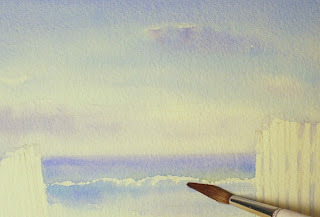 Before the sky totally dries, I paint the water line at the horizon with a cool blue. This makes a soft line which helps it look like it has receded into the far distance. The color of the water becomes a warmer blue tone as it is closer to shore. I leave white to show surf crashing in. 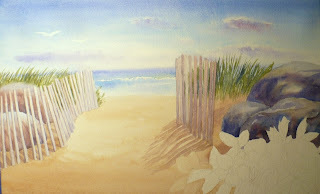 Next, I wet the sand area and paint it with a mix of yellow, red and blue. I add a darker tone at the bottom to give the painting a base or as some call it a "threshold" that the eye visually steps over into the lighter areas beyond. The dunes are next and they are covered with dune grasses. 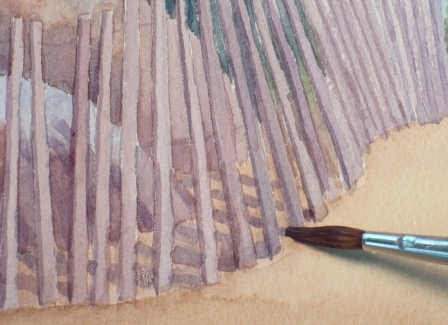 To paint these, I use a pointed round brush to quickly flick grass onto the paper. 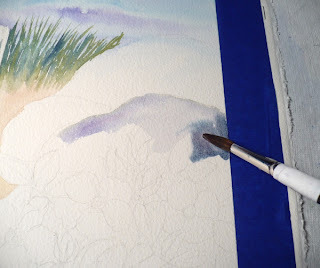 When the far tops are painted, I'll add more green grasses in front of them. Here is the painting so far. 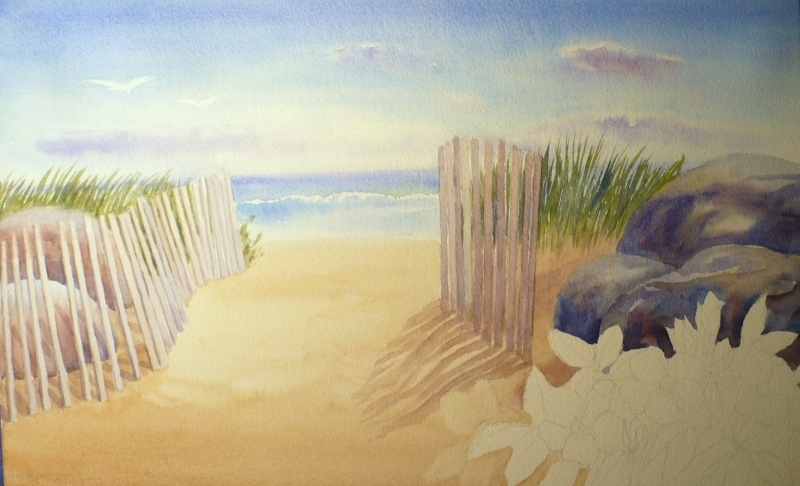 I have added grassy dunes to the right and left of a sandy walkway leading onto the beach. I have carefully painted around the snow fence. 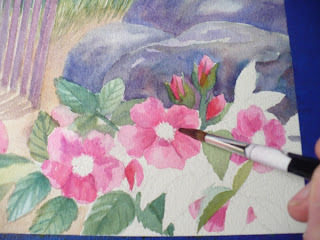 With watercolor, light areas need to be masked or painted around. Since watercolor is transparent, there is no way to paint a lighter value over a darker one. I prefer to paint around objects rather than use a masking technique. 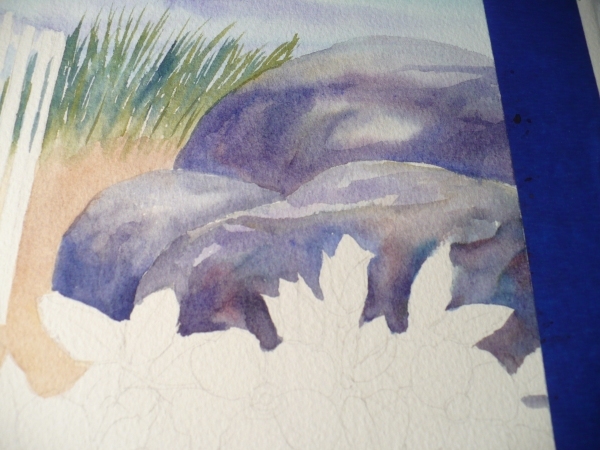 I have added some rocks to the right hand side of the painting. 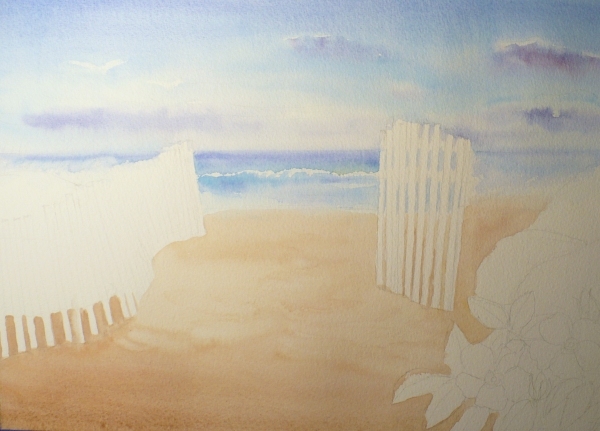 These will add interest and provide a backdrop for the beach roses I plan to paint in the right foreground. I wet each rock first and then add red, blue and yellow mixtures and let them flow together to make a rock-like texture. Next I'll paint the snow fencing and the cast shadows. Shadows and cast shadows help show the time of day. In this scene, it is afternoon. We are facing south toward the ocean so the sun in the west is to the right. This means the shadows will be on the left of any object. 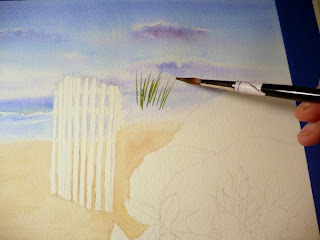 Here I paint the shadow from the fence on the right of the walkway. It is on a slight rise, so the shadow will slant down to show that. The rocks have been painted behind the left fence. 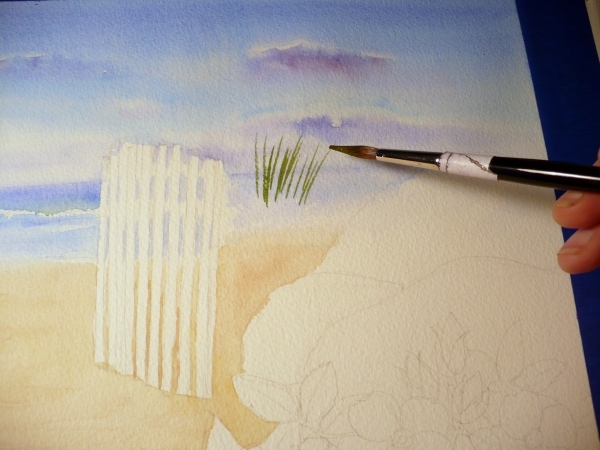 Once they dry, I can paint the cast shadows from the fence running along the sand and up the rocks. Here is the painting so far. 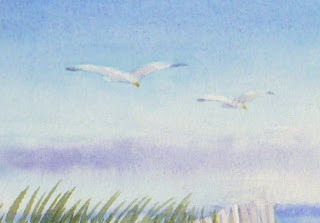 I like the soft mood of this piece especially in the distance where the sand meets the water. The right foreground still needs to be painted. I have left the area for some rugosa roses. 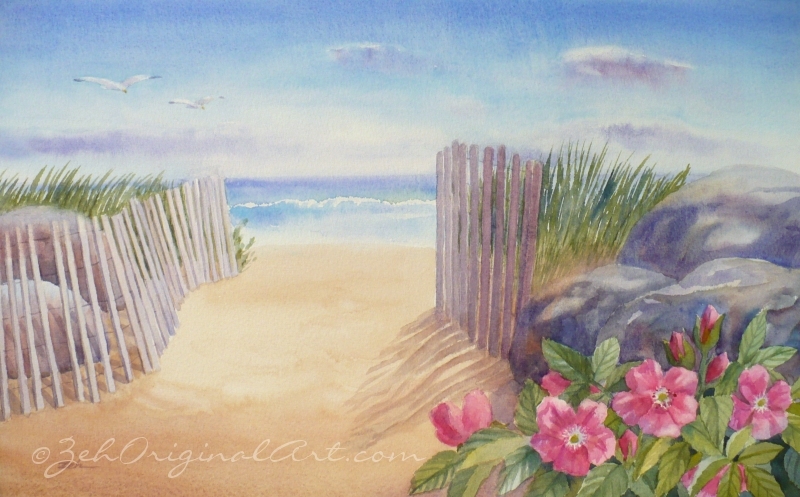 I love to add beach roses to beach scenes from New England since they are found all along the coast. These roses will typically grow in the dunes and along pathways to the beach. Once the roses are done, all that is left is to add details on the flying seagulls: some yellow for their beaks, shadows to give them form and dark feathers on their wingtips. Now the painting is complete and you can see it below. Click on the image to see it larger. 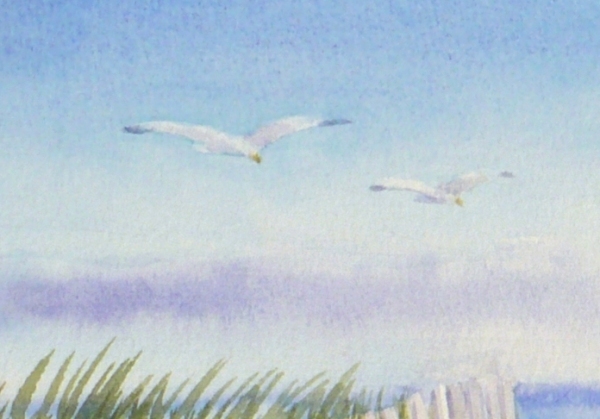 "East Beach, Rhode Island" is a soft, dreamy painting. The pathway draws your eyes beyond the foreground to the ocean. Perhaps you will dip your toes in the water, jump in for a swim or take a walk on the firm wet sand along the edge of the surf. Thanks for stopping by. I hope you enjoyed the demonstration. The print of East Beach is available in my Etsy shop here East Beach fine art print. 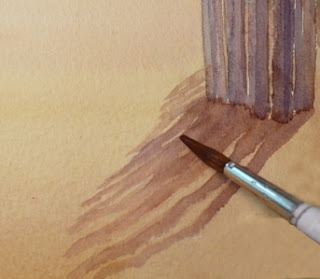 What a nice painting to post a demonstration of. I'd sure like to go walk on that beach. Out here in Cali, mostly we have ice plant that grows along our beaches, supposedly planted to stop the dunes from eroding. It's hardly as picturesque as roses. Thanks Kessie, East Beach is lovely although your beaches in California definitely are too! I did not know about ice plant, I had to google it. The flowers remind me of asters.